We often have the perception that Indian food can be challenging to cook. 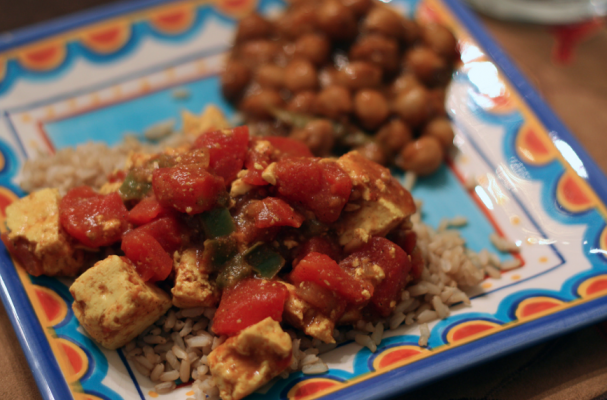 Recipes like tofu and chickpea masala are a great introduction to cooking Indian cuisine at home. A flavorful tomato sauce spiced with garam masala, garlic and ginger is studded with tofu and chickpeas. The flavors are rounded out with yogurt and a splash of fresh cilantro. Step 1: Heat the oil and ghee in a large saute pan over medium high heat. Add the ginger, garlic, and jalapeno pepper and cook until fragrant, about 1 minute. Add the tomato paste, garam masala and paprika and continue to cook for another minute. Step 2: Add the tomatoes and vegetable stock to the mixture and season the sauce with salt and pepper. All the sauce to cook for 15 to 20 minutes to allow the tomatoes to release their juice. Using an immersion blender, puree the sauce until smooth. Add the cubed tofu and chickpeas to the pan and continue to cook for an additional 20 minutes. Step 3: Taste the curry to make sure the seasoning is well balanced. Remove from the heat and stir in the yogurt and fresh cilantro. Serve with rice.